The following post comes courtesy of Sinosphere, the China blog for The New York Times. Like a flower poking out of the cracked pavement of a concrete jungle, this is another hopeful sign that ‘The Greening of Asia” is starting to blossom. 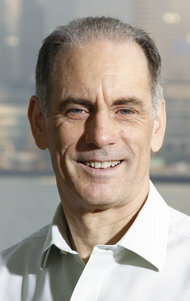 After 20 years in Asia as a journalist, Mark Clifford took over as executive director of the Hong Kong-based Asia Business Council in 2007. 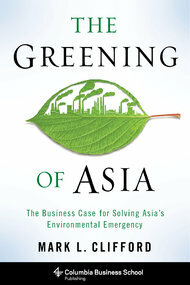 His new book, “The Greening of Asia: The Business Case for Solving Asia’s Environmental Emergency,” explores how Asian companies are making strides in providing environmental solutions. China is a special focus because of the country’s huge emissions of carbon, but also because of its potential for innovation. Q.: How did you get interested in this topic? A: I joined the Council in 2007 and inherited an almost-finished study on green buildings. That was pretty exotic in Asia back then, and we published a book on it. It got me thinking about the topic. Q: Your angle is a bit more hopeful than some. Tell us how that came to be. A: Originally, I thought I’d do a book along the lines of “The East Is Black.” And we do have an emergency here. In China, 1.2 million a year are dying prematurely. People need to know how bad it is, but then I got to thinking that this was pretty obvious. Instead, I thought that there are these much more positive responses underway, and people should know about them. The business community, which takes challenges and solves problems, was involved. So it is unabashedly a glass-half-full book, but that’s because it’s important to know there’s a way out. We can despair, we can do nothing, or we can work to solve one of the greatest challenges of our time. Q; Do you see business being the main player in solving the issue? A: No, it’s part of the solution. There has to be a three-legged stool of government, civil society and business, and each has to bring its strengths to the table. Only governments have the power to set rules — the laws and regulations, of course, but also the prices in the forms of taxes and subsidies as well as facilitating infrastructure developments. Media and NGOs make sure that business and government are doing what they promise. Q: What was most surprising is how many companies are doing this in one form or another. A: Yes, in the book I profile more than a dozen companies at length but also have an appendix of more than 50 companies that are involved with a variety of environmental initiatives. It was surprising to me what’s going on at the corporate level, but they’re doing things for good business reasons. Some are for the P.R. effect, but most look at it as necessary for survival. Q: You focused one chapter on Hong Kong’s CLP Holdings, the electric power company. A: Their work really sparked this project. In 2007, the then-chief executive, Andrew Brandler, announced that by mid-century, they would cut the carbon intensity of their electricity production by 75 percent. This pledge by one of Asia’s biggest private utilities — mostly coal-fired power plants — to effectively decarbonize by mid-century is unparalleled globally. I think this stems from the Kadoorie family, which owns a major stake in CLP. Michael Kadoorie challenges his top management to look at 50-year horizons. They do this for good reasons. They’re traditionally a coal-burning utility, but they think that this isn’t a good business model in 50 years. Other companies think that water is underpriced, and in the future, it will be more realistically priced. Carbon also is underpriced, and other companies want to be ready for when it’s changed. But not all companies have long-term visions.To reach them, you need the other two legs of the stool. You need good, strong government policy, and you need NGOs to hold people accountable. Q: What countries have had good policies? A: Singapore has done an exemplary job. They decided very early on that water is of existential threat to the nation. So they have taken very firm policies, and it gives companies a form of certainty about costs.Not every country has the capacity that Singapore’s administration has, and it’s a small place with a forward-thinking government. It’s much harder in big countries like China and India, which are more fragmented. Q: You have a lot on China. A: The good news is we have good policies coming down from the top levels of the Chinese government. Where China continues to struggle is the implementation at the ground level. There’s not always enforcement, and there’s no civil society to act as a check. The time when China decides that the environment and energy issues are as much of a threat as the color revolutions were, or the Hong Kong protests were last year, that’s when we’ll know we have serious progress. We’ve seen with Chai Jing [whose popular documentary film on the environment, “Under the Dome,” was banned] that civil society is muted. Q: We read a lot about air pollution, but you also think that water is crucial. A: Increasingly, water is a hard-stop issue. Air pollution is horrible, but most people affected by it are still living. But no one can live without water. I don’t know what people will do when the water stops. In China, projects like the South-North Water Diversion Project just delay the day of reckoning. What concerns me is that even most otherwise far-sighted governments are not facing up to the challenges. For example, what do you do if you’re a municipal official, and you have an industry, say semi-conductors, which uses a lot of water? What do you do when you have to make a choice: water for the factory or the town? These are the kinds of choices that aren’t going to happen today or tomorrow, but governments will face this. Q: And yet there are signs of hope in China. 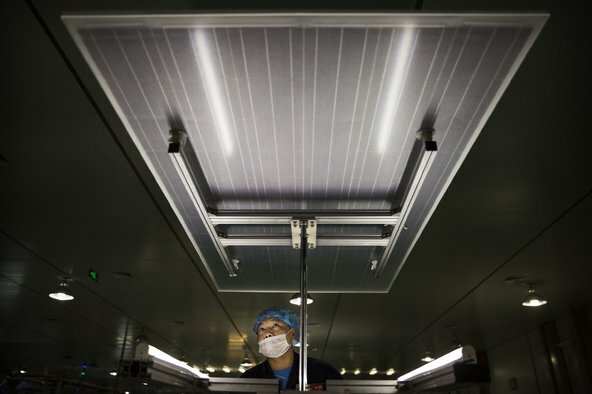 A: China is about to overtake Germany as having the largest amount of installed solar power capability. It also has large wind turbine facilities. All of this is important because China burns half the world’s coal and accounts for 30 percent of carbon dioxide emissions. So to fix China, we need to cut coal use. Coal is supposed to peak in 2030, but it could happen a lot faster. So these are huge challenges, but China is potentially further ahead than many people realize.